There are dozens of different options out there these days for people in search of a good smart thermostat. Of course, there’s still only option for anyone looking for the best of the bunch. 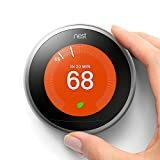 The Nest Learning Thermostat still sports a design and features that can’t be beat, and it’s currently on sale on Amazon at a discount of more than $40. This is probably the best price you’ll find until Black Friday, so grab one while you can.